While people still suffer for their internship, here's come my last day in this company, one week lesser if compare to them; our lecturer knew it, and say okay! The day didn't went smoothly either, many things to settle with, were so busy and when the day nearly came to an end, I just had some spare time to take photos with lovely people there. Guess what, I gonna miss faces over there. With workers: Salim, Baby Miyoko and 'Weng Eng' (do not know how to spell his name). Supervisor Eddie, Lay San and Su Ling. We trainee, Ah Min, Seik Yi, Bie Bie and me with Miss Phang and Ah Lye. 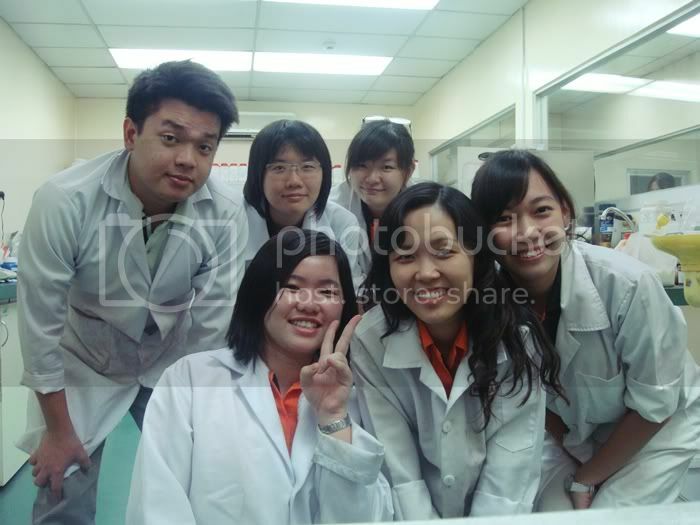 These people always make me laugh in the lab, I miss the laughter now. Too bad there were no time for me to go Industrial Lab to take photos with chemists, and here are some of the photos only. I might get some new photos when I back to this company next week? Say bye bye and that is really come to an end now.